Tomorrow, we head back home to Ottawa. I didn’t think we’d have a chance to make it on any more food adventures. This morning, after a quick visit to the Great Wall of Los Angeles, Kitt suggested we go to Petit Trois. It’s one of the restaurants I had on my list after watching the last season of The Mind of a Chef and I was delighted we could fit it in. 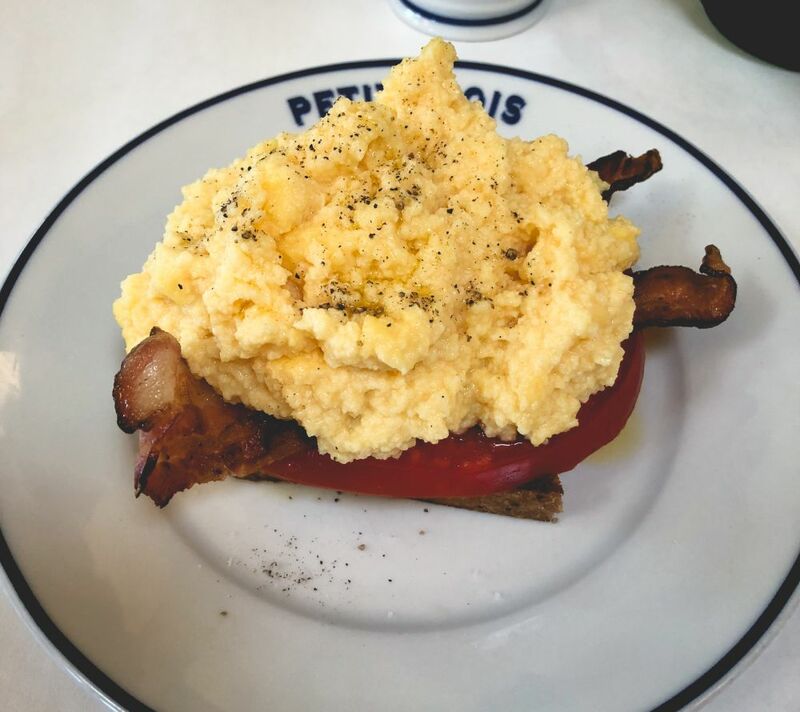 Petit Trois, unlike it’s sister restaurant, Trois Mec, is open for breakfast and lunch. It’s run by Ludo Lefebvre, who is a Frenchman who has spent the last 20 years in L.A.. I was delighted to find beignets at the top of the menu. You’re damn right I ordered one. These beignets weren’t like the ones you’d find at Cafe du Monde in New Orleans, all covered in powdered sugar. No, these were covered in granulated sugar and filled with a not-too-sweet custard. They were so delightfully wonderful. I chose a bacon and tomato tartine, which is an open-faced sandwich—this one topped with scrambled eggs. Every bite of this was tasty, with a wonderful mix of flavours and textures. The bread wonderfully crunchy, the bacon not overdone, the fresh tomato, and the perfectly cooked eggs with a bit of oil and salt. Kitt had an omelette, which I had a bite of. It was tasty but I felt like it would’ve been overwhelming to eat the entirety of the rather sizeable portion. If I ever make it back, I know I’ll have another tartine. Verdict: I’d definitely take the time to go here again—and sit at the kitchen counter to watch the chefs!